Bronchiolitis is a lower respiratory tract infection that commonly occurs in children under two. It is usually caused by the respiratory syncytial virus (RSV) which triggers the inflammation of the smaller air passages (bronchioles). The inflammation causes the partial or complete constriction of the bronchioles, resulting in wheezing and shortness of breath. Bronchiolitis is the leading cause of hospitalization in infants and young children. Since there is no cure for bronchiolitis, treatment is primarily aimed at alleviating symptoms of fever and breathing difficulties. If hospitalization is required, the treatment may also include supplemental oxygen and intravenous fluids to prevent dehydration. In the past, the drug albuterol was commonly used in hospitals to help the child breathe. Albuterol is classified as a bronchodilator which works by relaxing muscles in the air passages. It is available in inhaled, oral, and injectable formulations and is commonly prescribed to people with chronic obstructive pulmonary disease (COPD) and asthma. While it would it seem reasonable to use albuterol in cases of severe bronchiolitis, updated guidance from the American Academy of Pediatrics (AAP) now recommends against its use. 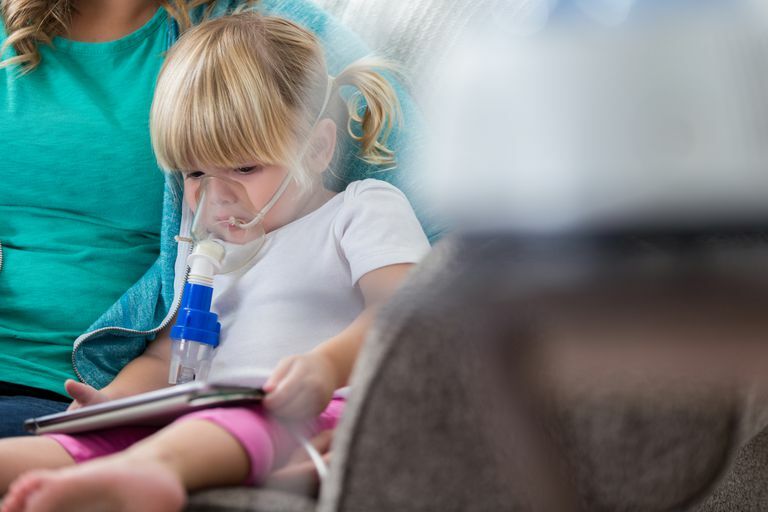 In their updated 2014 recommendations, the AAP acknowledged that albuterol can provide transient relief in children with bronchiolitis in the same way that it does asthma. However, the actual effectiveness of the drug in this scenario was largely subjective. Current research has shown that the use of albuterol in hospitalized children did nothing to improve outcomes or reduce hospital stays. Moreover, the AAP recommends against other treatments commonly used in the past, including nebulized hypertonic saline, systemic corticosteroids, antibiotics, and chest physiotherapy. A parent will know that it's time to take the child to emergency if the wheezing lasts for more than seven days or progresses to grunting. Similarly, if the child weakens considerably and has a bluish tinge to the skin or lips (cyanosis), the parent should consider it a medical emergency and call 911. Approximately three percent of children with bronchiolitis will require hospitalization. Treatment would involve the monitoring of vital signs and supportive care based on the child's condition and symptoms. Supplemental oxygen may be needed for children who are unable to catch their breath. This is usually done by placing a tube, called a nasal cannula, under a child's nose or by using a face mask. For infants, an oxygen head box may be used. If the child is unable to eat or drink, either because the respiratory rate is too fast or breathing is severely impaired, fluids and nutrition may need to be delivered intravenously (into a vein).To prevent the spread of the virus, the child would be isolated from siblings and other children until the condition is fully resolved. Most children hospitalized for bronchiolitis are well enough to return home after three to four days. Hall, C.; Weinberg, G.; Blumkin, A. et al. "Respiratory syncytial virus-associated hospitalizations among children less than 24 months of age." Pediatrics. 2013;132(2): e341-e348. DOI: 10.1542/peds.2013-0303. Ralston, S.; Lieberthal, A.; Meissner, H. et al. "Clinical Practice Guideline: The Diagnosis, Management, and Prevention of Bronchiolitis." Pediatrics. 2014; 134(5): e1474-e1502. DOI: 10.1542/peds.2014-2742.